It's that time again, magpies: our weekly roundup of royal jewels is here! This week seemed like it absolutely flew by, and the royals were busy bees. 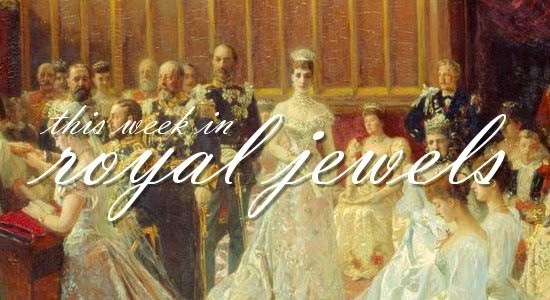 Enjoy the royal jewels they wore! 10. In Monaco, royals from Belgium, Luxembourg, and Saudi Arabia were among the attendees joining Prince Albert at a charity dinner for EORTC on Wednesday. Princess Astrid of Belgium accessorized her red dress with a shimmering bracelet and earrings. 9. Also at the charity dinner in Monaco was Princess Sibilla of Luxembourg, who made a pair of large earrings the focus of her jewelry. 8. Princess Marie of Denmark showed off a gorgeous ring on the cover of the October issue of Costume magazine. 7. Before returning to Sweden for Tuesday's Riksdag opening, Queen Silvia visited her younger daughter, Princess Madeleine, in New York. While representing their World Childhood Foundation at the Global Citizen Festival, the two glammed up their casual attire with stacks and stacks of bracelets. 6. An understandably somber Duchess of Cornwall wore pearls to mourn the late Dowager Duchess of Devonshire, whose jewels we remembered fondly last weekend. Camilla chose one of her trademark pearl chokers, specifically the one with an all-diamond clasp, as well as earrings with pearl drops and a shamrock brooch made of diamonds and turquoises. 4. Queen Maxima of the Netherlands rarely disappoints when it comes to earrings, and on Tuesday, she wore an especially dangly silver pair to the opening of the Micropia Museum. 3. Queen Mathilde of the Belgians selected blue earrings to coordinate with her dove-gray dress for a visit to the SHAPE in Mons on Tuesday. 2. Another outing for Queen Maxima saw her bring out some serious sparkle. She wore her own pair of diamond and ruby earrings to open the new Markthal in Rotterdam on Wednesday. 1. Even more glamorous rubies were worn this week by Crown Princess Mary of Denmark, who donned pieces from the ruby parure that originally belonged to Queen Desiree of Sweden. Although Mary usually reserves the rubies for white-tie events, she wore them on Saturday with a cocktail dress for the annual Crown Princely Couple awards. Are you on Instagram? Find me there at courtjeweller for more historical sparkle!